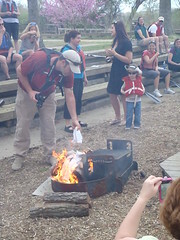 York River State Park first kicked off the canoe and kayak season with the “burning of the socks” ritual in 2011. Celebrating a water sport by setting something on fire seemed like a good idea in and of itself. But, as with all traditions, this oddity of our park does have a history. Bob Turner, a long time worker at a yacht club near Annapolis MD, is said to have been the founder. The winter of 1976-77 was particularly cold. Bob and some of his fellow boat workers were more than ready for the spring equinox, the traditional start of the boating season. When that first day of Spring came, they took off their socks, placed them in an old paint can, and ignited them. They toasted their new ritual with cold beer. Of course, we are not offering alcoholic beverages. But, at York River’s “Burning of the Socks,” we do offer a bit of tradition as we burn our worn out, natural fiber hosiery, honor those who started the tradition as we read “Ode to the Sock Burners,” and supply humor as we sing our invented hymn, “I Wanna Burn My Socks.” If the water and air temperature adds up to 120 degrees or above, our interpretive staff will lead guess on the first paddling trip of the season. Bring your own watercraft, or rent a canoe, solo, or tandem kayak from us. The festivities begin at 10:00 a.m. Saturday, April 11. Our rain (or too cold) date will be Saturday, April 25.